Commercial Angler combines the excitement of deep sea fishing with progression in successful entrepreneurship in the commercial fishing industry. In the modern marketplace, global demand for ever-increasing amounts and varieties of edible seafood has resulted in rising prices. As a result, ambitious commercial anglers like yourself are setting out to sea to fill this demand, eager to begin converting marine biomatter into large piles of money. Untried anglers should beware, however. The source of your profits will vigorously defend itself from being taken into your possession. As the marine lifeforms whose bodies you need to collect to exchange for money won't cooperate willingly, you will have to seize them by physical force. This process can be dangerous, especially when using inferior equipment. Thus, mastery of fishing and sailing skills are as much key to your continued survival as they are a part of your job. The open sea is an unforgiving environment, and its inhabitants battle for mortal stakes. Back in port after a long day at sea. In the midst of bitter combat. Source: MS Visual Studio 2005 project files in C# are browsable and forkable on GitHub. When you start a new game, you'll only have a wooden log to sail in and your bare hands for which to assault fish. 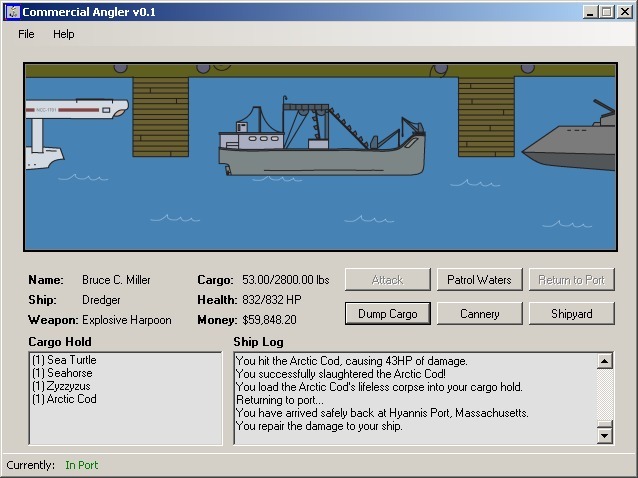 As you collect and sell catch, you'll be able to afford better weapons and ships. During these first few days, be careful not to attack creatures too much more powerful than you. Judging whether a creature is out of your league is part of being successful in the fishing industry. Use a sensible combination of knowledge of marine biology and an evaluation of your current HP and equipment. Your character may occasionally react to creatures he finds particularly fearsome as well. If in doubt, simply continue patrolling - better to lose a few dollars on a prize catch than your life, after all. You may also flee from a battle not going your way. The quality of your vessel also limits how far out to sea you can go, so the lower level the ship, the lower the chance of meeting more powerful creatures. For the chronically impatient, the `File | Quick Start' menu option will start you off with some money and decent equipment. Should your ship sustain serious damage or your cargo hold be full of valuable fish, you should head back to port. Once in port, you will patch up any damage to your ship automatically. Afterwards, you can visit the Hyannis Cannery to exchange the fruits of your labor for US currency. Once you've collected enough, you can visit the Hyannis Shipyard where you can reinvest this money into your fishing enterprise. Here, you can upgrade or downgrade your ship or weapon, receiving credit on your purchase by exchanging your current equipment during the transaction. 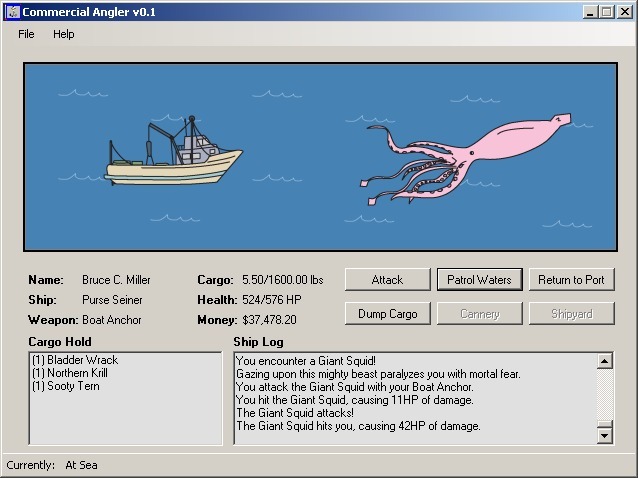 Like most simulations, Commercial Angler doesn't have any pre-defined goals. Play all day and night nonstop to see how quickly you can get the best ship and weaponry available. Or, relax and bask in the endless blue pixels of the northern Atlantic. You could open a text editor in another window and keep a captain's log of your adventures (both in-game and imaginary) or the types of existential musings that long, lonely days at sea often engender in an introspective mind such as yours. As a fan of maritime profit-making, you're probably smart enough to come up with plenty of your own ideas. Forthcoming features: Loading and saving your game, custom character naming. Other possible future features: Improved graphics, RPG-like elements such as player levels and stats, end-game bosses, ability to eat fish, drop tables besides just corpses, confirmation beeps when buying stuff, uploading memorial files to a web-based CGI script. For those who can't figure it out: Yes, this isn't a serious game. It was just tossed together in a couple days to refresh my C# memory prior to starting a new job. I'll try to turn it into something actually fun someday, maybe.